Glenafton more than matched an Airdrie side comprising a mix of first team regulars and U19 squad members for much of this keenly contested match. The surface may have been artificial (although of stunning quality) but the effort on the pitch and desire to win from both sides were the real deal. The Glens introduced new signing Lewis Sloan in left midfield and up front Jim Wilson partnered a Trialist forward, who had greatly impressed in the Annbank game. The visitors started brightly in the light and shadow that bathed the pitch in equal measure with Paul McKenzie dancing his way past a string of Diamond defenders but his shot at goal was blocked in time. The home side forced the first corner of the game minutes later but didn’t trouble Ally Semple in the Glens’ goal, and so emerged a pattern of end to end play. On 16 minutes the Glens’ Trialist powered his way to the edge of the box but his equally powerful blast at goal was brilliantly tipped over the bar by the agile Airdrie stopper in acrobatic fashion. Midway through the half the home side passed up a couple of carbon copy chances to take the lead. Fine work down the left flank followed by neat cut backs into the box failed to be finished off by the front men and the impressive Craig Menzies ably supported by Ryan McChesney mopped up the danger. 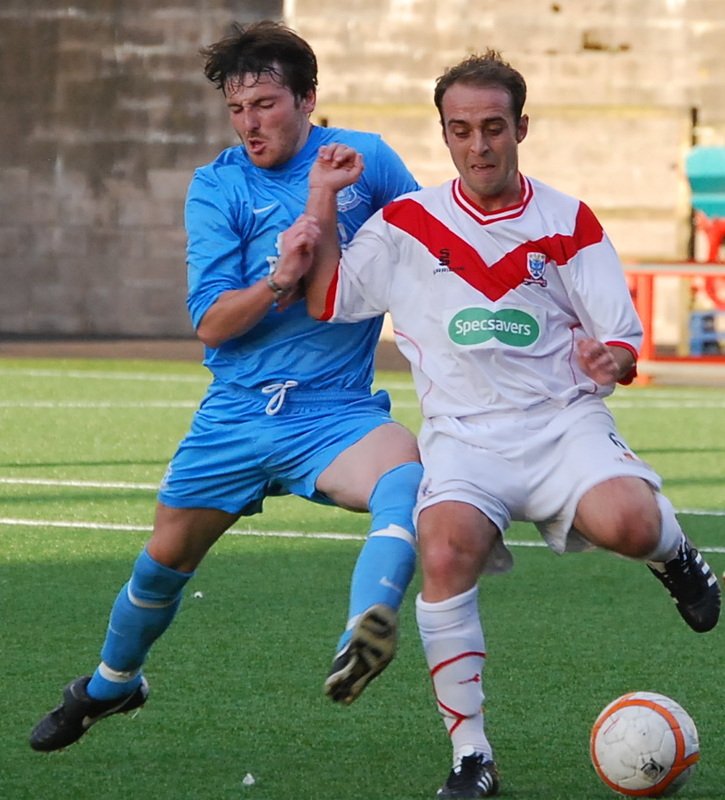 Soon after Menzies and Airdrie’s new signing John Boyle accidentally collided and the former Talbot star’s game was over. Three minutes later after a head knock Richie McKillen followed suit, blood streaming over his head like raspberry over a cornetto, soon to be stopped by a stitch or two at Monklands hospital. The second half started the way of the first with Taz McKenzie testing the keeper but a corner kick the only reward. On 52 minutes the tireless Trialist forged his way down the the right, holding off defenders, before picking out Wilson in the box whose knock-on header fell for Lewis Sloan who gathered the ball well but his shot cannoned off a defender and looped over the bar. The home side rallied well and in particular one of the second half subs was proving a handful down the right wing with some skillful play but more often than not the final ball was not of the same quality. A decent showing from the Glens with Paul McKenzie in sparkling form, Craig Menzies solid in defence. Kris Mitchell in particular had an oustanding match , showing a great touch, not one to shirk a tackle and not too shabby in the air as well. 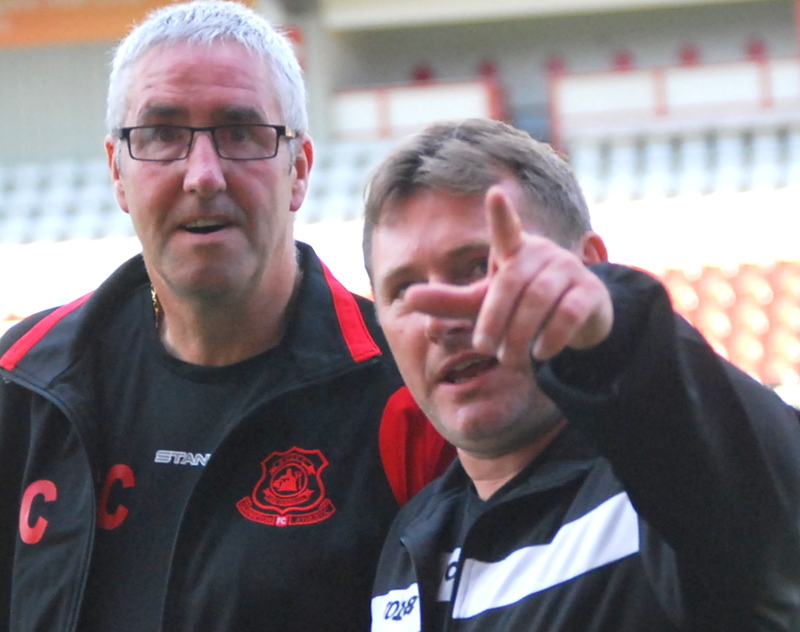 Glenafton asssitant manager and Airdrie legend Sammy Conn with Airdrie Manager Jimmy Boyle pointing out another weil kent face in the stand.